These Paleo pumpkin muffins are a healthy treat anytime of year! Egg and nut free, these moist and dense little morsels will make a perfect afternoon snack! Another Paleo treat with no nuts and no eggs…..my newest baking challenge! 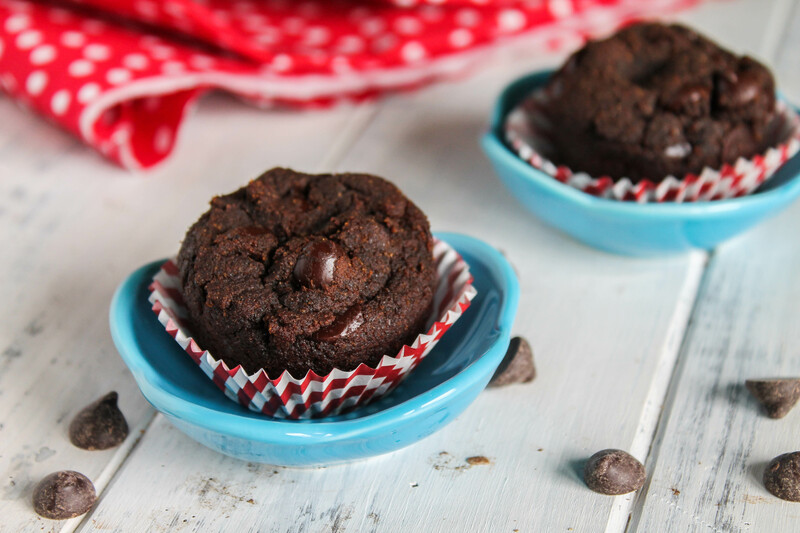 A moist Paleo pumpkin chocolate muffin free of all grains, eggs, dairy, and nuts. Paleo baked goods without nuts and eggs are not an easy task. Coconut flour is an easy enough option, but coconut flour LOVES eggs, so figuring out a way work with one and without the other can be a bit daunting. But necessity is always the mother of invention! Pumpkin, which I have used frequently to replace eggs in regular gluten free vegan baking. It functions much the same as sweet potatoes, banana, or applesauce would. The other is psyllium husks. Psyllium is a seed and is sometimes taken in supplement form…a major insoluble fiber source. While psyllium is the big guns, I have an instinct that chia seed meal (a reader said it did!) might work well here too, and I would like to try a gelatin gel as well. But my guess is either one of these will only work in conjunction with the other binder (fruit and veggie purees). Time will tell! I couldn’t keep my kids out of these….shocking considering they usually dislike Paleo baked goods and are not fond of coconut flavored things. The cocoa powder masks the strong coconut flour taste! Can you limit the added the sugars? You could make these by subbing at least half of the pumpkin with banana puree and leave the sugar out. They will not be super sweet with only bananas doing the sweetener duty. You could consider adding some pureed dates too (also a good binder), or a favorite low carb sweetener. Just make sure you use about a 1 3/4 cup pumpkin/banana/date puree total! Because of the psyllium seed, these will be a bit gummy on removal from the oven but achieve texture perfection when fully cooled! Need more grain free/egg free recipes? Here are a few to try! cranberries, cherries, chocolate chips, toasted nuts. Preheat oven to 350 degrees, grease a mini muffin or muffin tin. In the bowl of a mixer, mix the pumpkin, sugar, oil, vanilla, psyllium husks, and stevia. With the mixer running, sprinkle in the baking soda, powder, and sea salt. Continue with the coconut flour and cocoa powder. Mix in any add ins if you choose. Roll about 3 tablespoons of dough (about 4 for large muffins) in your hand. Mixture should be easy to handle. Place in prepared muffin tin, should fill to the top: these do not rise or spread out much. Bake for about 20-23 minutes for mini muffins, and an additional 5 minutes for large muffins. The muffins will be soft when they are removed from the oven, and a bit jelly like from the psyllium. The best texture is achieved when they have fully cooled! Can be stored on the counter in an airtight container for several days. I love that you used the pumpkin! When my son was small he couldn’t have egg so I was always on the lookout for baked goods without it! I love all things pumpkin with chocolate during the fall. 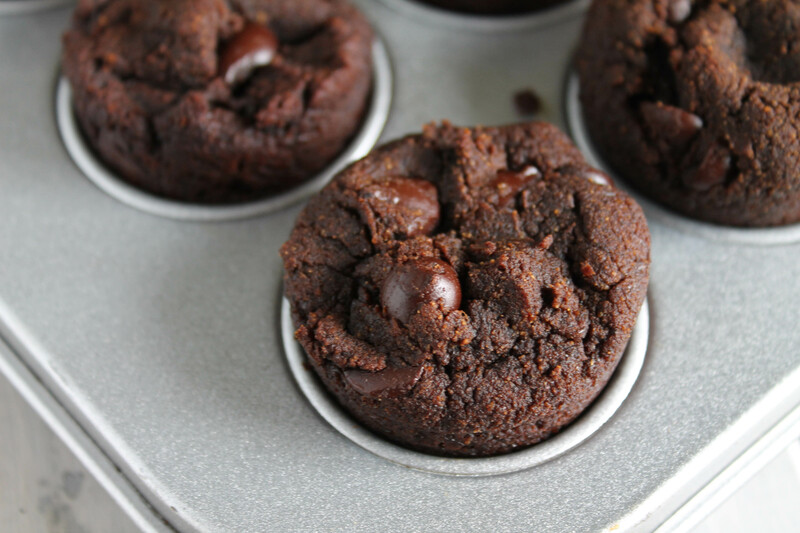 These texture of these muffins is so perfect! Pumpkin and chocolate – nice!! I have recently gotten into putting these together and am loving the combo! You can’t go wrong with pumpkin and chocolate! Yum! I really need to try baking with psyllium husks more often. 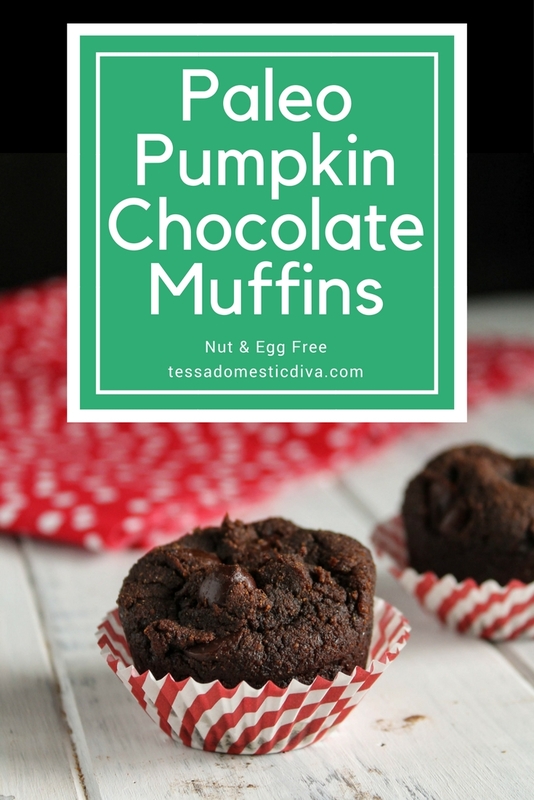 Love this pumpkin + chocolate combo! What a great way to start the day, with a healthy yummy breakfast muffin. Thanks for all of the ideas ~ love your substitution tips.. Got me thinking about how to make these for my family! Look SO delicious too! I love this is nut and egg free, it’s perfect for my kids. It’s been so hot and smoky with wildfires this summer, I’m so excited for all thing fall! These pumpkin muffins look like just the cozy thing to be baking just as soon as I get a cool day! It’s still 100 degrees here, but I’m already thinking about pumpkin. These look so delicious. I love the added cocoa! These look so good! It’s hard to believe that there are no nuts or eggs from the photos. I’m going to give these a try! I am so ready for the pumpkin! Ahhh good for you! Coconut flour without eggs is SO hard! These really look great, and so safe for so many people. My girls would totally eat these – can’t wait to try them! So good to know that pumpkin can be used to replace egg. I’m always looking for ways to bake / cook without eggs as my little one is allergic to it. 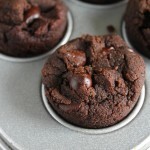 You can’t go wrong with chocolate muffins and these look divine! Such a perfect breakfast when you want to treat yourself. Paleo pumpkin chocolate muffins looks really delicious and nice. thanks for sharing with Hearth and soul blog hop, pinning. This recipe is perfect for our family. I need to make a delicious muffin for my picky husband who has to watch his cholesterol. He loves to eat muffins with his morning coffee. These muffins are perfect and I think he may not realize that they are secretly good for him. 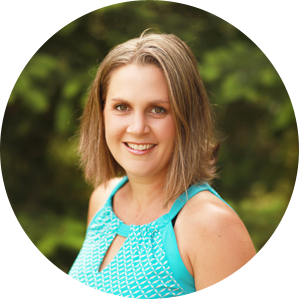 I am so delighted that you shared your healthy and delicious paleo pumpkin muffins at the Healthy Happy Green Natural Party! I’m Pinning and sharing this! Those look delicious and pretty cute, too. 😉 Pretty sure they’d be a hit around here! Thanks for sharing them at Savoring Saturdays! These look perfect! They’re going on my list of must try things! I know what you mean about nut free/egg free paleo baking too – I like making nut free recipes but it can be such a pain sometimes. Love that you used pumpkin puree instead of eggs! These sound amazing Tessa! Thanks for sharing them at Savoring Saturdays! Just wanted to let you know I made this today and subbed chia seeds 1-for-1 for the psyllium husks and they turned out perfectly! hey there Stacey! A reader submitted that comment, and I had to post it when the comments were broken temporarily. She said she used 3 tablespoons chia meal and that it worked well!